In 1995, the Italian neurophysiologist Giacomo Rizzolatti discovered in experiments with apes that a certain part of their cerebrum reacts when a targeted hand-to-object movement is made. This part also reacted when they only observed the movement in other apes. This is due to something known as mirror neurons. Mirror neurons are nerve cells which trigger the same impulses in the brain while watching a process which would occur if the process was actively performed by oneself. Brain cells with this double function started to inspire the imagination of researchers and scientists and enabled them to better describe everyday phenomena. Rizzolatti further found that we are constantly in communication with others through mirror neurons and consciously or unconsciously imitate other people. The recently discovered mechanism in the brain, the imitation inhibitor, blocks the development of mirror neuron so that no movement impulses can be sent to the muscles. Researchers also consider the recognition of intentions - meaning anticipating an action - to be a possible function of mirror neurons. An everyday example by Franz Mechsner from the Max-Planck-Institut for Psychological Research in Munich illustrates the recognition of intentions. "When we see a person on a zebra crossing we do not observe that one leg is slightly in front of the other and the head turned to one side. We see that someone wants to cross the street." This ability can support learning complex sequences of movement. In human beings these cells have so far been discovered in the brain's Broca's area, the speech centre. Accordingly, these cells seem to have enabled us to learn language. Examinations have shown that in autistic children (= pervasive developmental disorder, described as a hereditary, incurable perception- and information-processing disorder of the brain) these cells do not function properly. This could explain why the social behaviour and speech of these children are impaired. Even if there is no scientific evidence to back it up yet, the correlation between mirror neurons and the capacity for empathy has been widely debated lately. 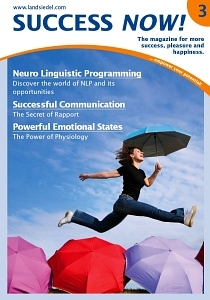 In NLP we can identify what someone is thinking about by "tracing the physiology" of that person.